India Today, the leading magazine in India, is now available as India Today Audio Magazine mobile app. The India Today Audio Mag is a weekly audio news magazine and provides the Indian news in full streaming audio to your mobile phone. India Today brings the best in politics, world events, sports, business, Bollywood, entertainment, and latest breaking news. This Audio Mag is read by professional voice artists, Abha Dawesar and Vaishali Sharma. 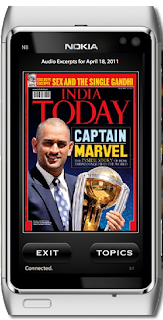 The India Today Audio Mag is a FREE mobile application and is currently available only on select Nokia Phones. You can download this mobile application from Ovi store.